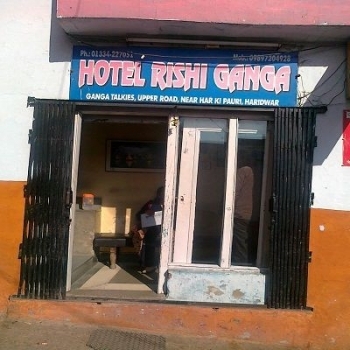 Hotel Rishi Ganga is one of best place to stay close to holy bath ghat, Har ki Pauri in Haridwar. The hotel offers well maintained accommodations with ample comfort and promt services. One can enjoy the proximity of holy Ganga river with spectacular views of Haridwar city. The hotel is centrally located at Ganga Talkies, Har ki Pauri. The bathing ghat is at some footsteps away from the hotel. Guest can easily visit Mansa Devi Temple and other important places in Haridwar. 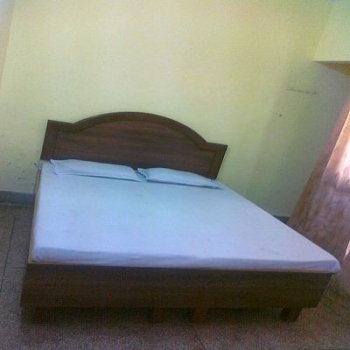 The hotel has total 15 well appointed Standard Non AC, Double Bed, Triple Bed and Four Bedded rooms with amenities like TV, telephone and attach bathroom. The hotel does not has its own restaurant. It offers fast room service and one can order food from nearby restaurant. Haridwar is a major city visited by thousands of pilgrims throughout the year. The hotel is at walking distance from Bus and Railway stations. One can easily reach Haridwar from Delhi (211 kms) by boarding ordinary or volvo buses. Haridwar railway station is well connected to major metros of the country. Nearest airport is at 35 kms in Dehradun, Jolly Grant Airport.